Retired Port Authority Lt. Bill Keegan, founder of HEART 9/11 (left); with Rich Miller, a retired detective with the NYPD’s Emergency Service Unit. Bill and Rich have teamed up to help with projects and raise funds for this remarkable charity that’s doing so much to help others. From an earthquake in Haiti to a hurricane slamming New York and New Jersey to the horrific school shooting in Newtown, HEART 9/11 has been there to help. 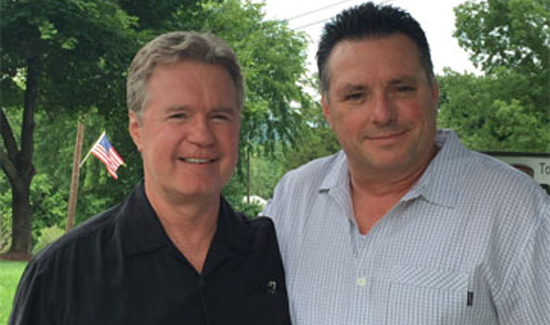 Bill Keegan and Rich Miller arrived at the World Trade Center site on September 11, 2001, and worked side by side doing the sacred work that was asked of them while extracting the hard-learned lessons of that rescue/recovery mission. They arrived as veteran officers from different departments – Rich with the NYPD Emergency Service Unit and Bill as a Lietenant of the PAPD (Port Authority Police Department) Special Operations Division – and left bonded by their shared experiences. Bill and Rich lost touch after their days at the WTC. After Bill retired from the PAPD, he went on to found HEART 9/11, a non-profit disaster-relief organization whose mission is to alleviate the suffering of individuals and communities coping with disasters. Rich continued with the NYPD and FEMA until his retirement in 2011. Little did they know that the next time they would work together would be on the streets of Port-au-Prince, Haiti, following the devastating earthquake that took place there in 2010. This time Bill was a volunteer with HEART 9/11 and Rich was part of the FEMA team New York Task Force One. As fate would have it, their paths crossed again earlier this year when HEART 9/11 arrived to work with the first responders following the tragic events at Sandy Hook Elementary School. Rich has since become a member of HEART 9/11, transferring the valuable skills he acquired as a 23-year veteran of the NYPD and ESU to help this community in crisis. He is honored to join forces with fellow NYPD/ESU Officers and friends, including retired Lt. Owen McCaffery (who has been working with Bill Keegan since the first days of Ground Zero and since the inception of HEART 9/11), retired Lt. John McArdle, and NYPD Police Officer Anne Margaret Tetukevich. The legacy of 9/11 continues in the spirit and actions of HEART 9/11 and its 400-plus members. When we deliver the service, duty, and expertise unique to veteran first responders, it has a tremendous impact on other first responders or victims in some of the world’s most horrific tragedies. The level of training and experience differentiates this volunteer group from other organizations. HEART 9/11 hopes to plug into the recently retired first responders across the country to give them the platform to continue to serve others. We are looking for new members that can respond to future disasters or community crises, which would include veteran home builds throughout the country. The caring spirit of a first responder is not extinguished upon retirement, rather our best qualities become more apparent and are vital to disaster response. 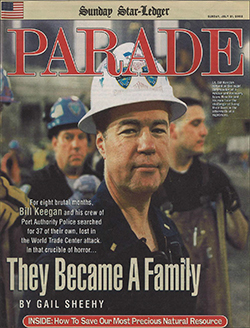 Lt. Bill Keegan was featured on the cover of Parade magazine after the attacks of September 11. HEART 9/11’s volunteer professionals – NYPD, PAPD, FDNY and NYC Building Trade Members – leverage their unparalleled experience, including the extensive WTC site response and recovery, to support, supplement and transfer skill and knowledge to ﬁrst responders, disaster victims, and returning veterans, in the same spirit that the world supported our community of New York City after September 11, 2001. Founded in 2007, HEART 9/11 is now over 400 core volunteers strong – an expert led, volunteer driven, nonproﬁt disaster relief organization committed to rebuilding communities and lives. Bill Keegan is the author of the book Closure, the untold story of the Ground Zero Recovery Mission, and Rich Miller is the subject of two books: Brave Hearts: Extraordinary Stories of Pride, Pain and Courage by Cynthia Brown and The First Responders by Anthea Appel. For more information on HEART 9/11’s work or to become a member, visit www.heart911.org.